It's time to dig out all your spare items for our GIANT SALE DAY on Saturday 5th. October to raise funds to enable us to offer help to the people who really need it.... see images for details. 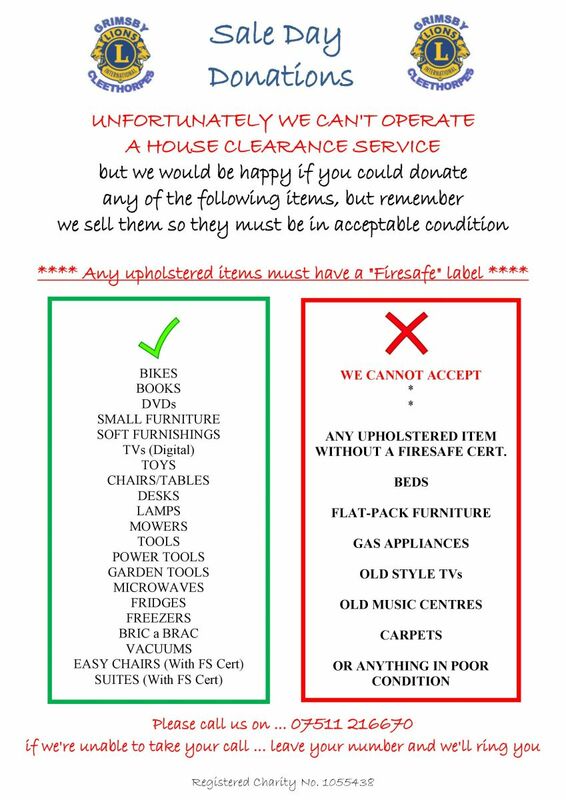 Just give us a call on 07511216670 to arrange collection. Our Lions club has just donated a total of £1300 to "Your Place" on Wellington Street, part of the East Marsh area, for repairs and refurbishment of the outside play area known as the "Ark Park". The "Your Place" staff and volunteers are doing a great job in the community in the most challenging area of the town. They deserve the thanks of the town, and all the support they can get. The picture shows our Community Service Chairman Mike Ledwith handing over the cheque to Sharon Hobbs, the project manager of "Your Place". Keep up the good work!! A fantastic total that will go a long way to helping us to do what we can for the people of North East Lincolnshire. Lions Clubs International was formed in Chicago in 1918, so this year has been a very special year for all Lions Clubs. As part of these centenary celebrations, all Lions clubs were encouraged to search out unsung heroes in their local community. 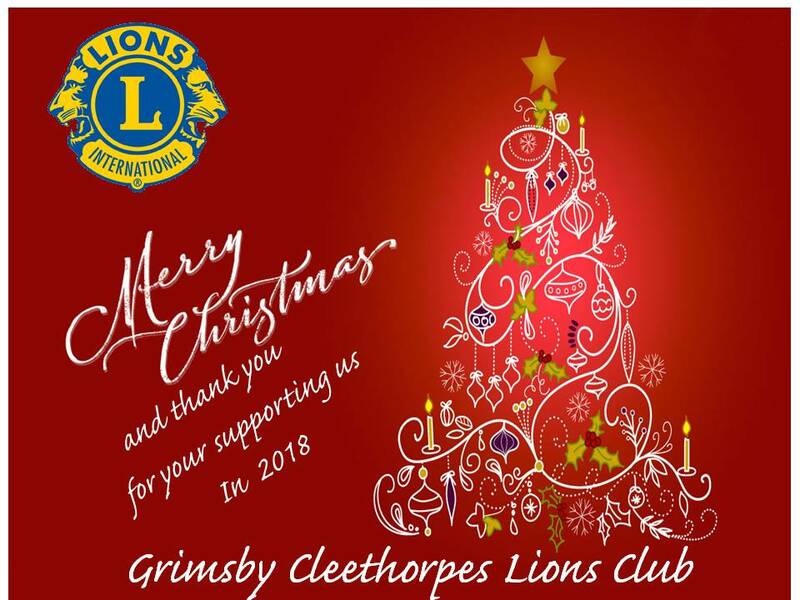 The Grimsby Cleethorpes Lions Club duly searched the North East Lincs area, and had great pleasure in recommending 4 local community volunteers to receive an award. The people selected were the Rev. John Ellis, Julie Lewis, Jenny Fallon, and Peter McRoberts. They were all accepted for an award, with Julie, Jenny and Peter all received a Centenary Certificate of appreciation, all signed personally by the Lions Club's Royal Patron, Sophie, Countess of Essex. The Rev. John Ellis was awarded an engraved glass memento. These local heroes attended a recent meeting of the Lions Club, and were presented with their awards by Lion President Mike Ramsden who explained why they were chosen, and expressed the gratitude of the whole community. The first recipient is Jenny Follan who is employed by Tesco Cleethorpes Store as their Community Services Champion. She works closely with some of the service clubs in the area eg Grimsby Cleethorpes Lions Club, Blue Cross Animal Centre, Rotary and many other organisations who need to use the facility at the store for raising monies for their operations. She has bent over backwards to help our club with it's Xmas Collections, Membership Presentations to the public and Lions Marie Curie Appeal. She has an allocated store room in the roof of the building where she stores goods from the Tesco supermarket that are old stock along with donations from other organisations. These are then distributed to various deserving families and groups throughout the year. From that room she has donated a Xmas Sleigh to the Lions club which after a little restoration will be used inside the store for the Christmas collections. She also has at her disposal a Community meeting room that is used by small local groups, at no cost, such as keep fit, slimming clubs and children's crèches for example. She has an amazing amount of energy and nothing is too much trouble. The second is Julie Lewis who is a Collabrative Assistant at the Hope Falls and Respiratory Clinic at the Val Waterhouse Centre in Kent Street, Grimsby. She has actively promoted and distributed the Message in a Bottle scheme through her Clinic and as a result of her enthusiasm and belief in the product and through the Grimsby Cleethorpes Lions Club, the Emergency Services and Nursing Services are fully ' On Board' with the campaign.She has also promoted the Message in a Wallet scheme as also the Plugster system. The third is Peter McRoberts, a volunteer who has worked tirelessly over the last fifteen years for St. Andrews Hospice, Grimsby. Peter has always supported the Hospice in many ways, from Fundraising, Gardening, working in the kitchens preparing vegetables and regularly keeping patients company on the Day Unit. Peter always likes to be Father Christmas, and his attitude is always friendly and caring. Two years ago he was nominated as the "Unsung Hero" at the Hospice, and the volunteer organisers and his colleagues believe that he would be the perfect person to be awarded this recognition. The fourth is The Rev. John Ellis who is the Project Manager for the Shalom project. John Ellis has been heavily involved with the community of St John, St Stephen and Shalom Youth Project for over 40 years. John received the glass award. 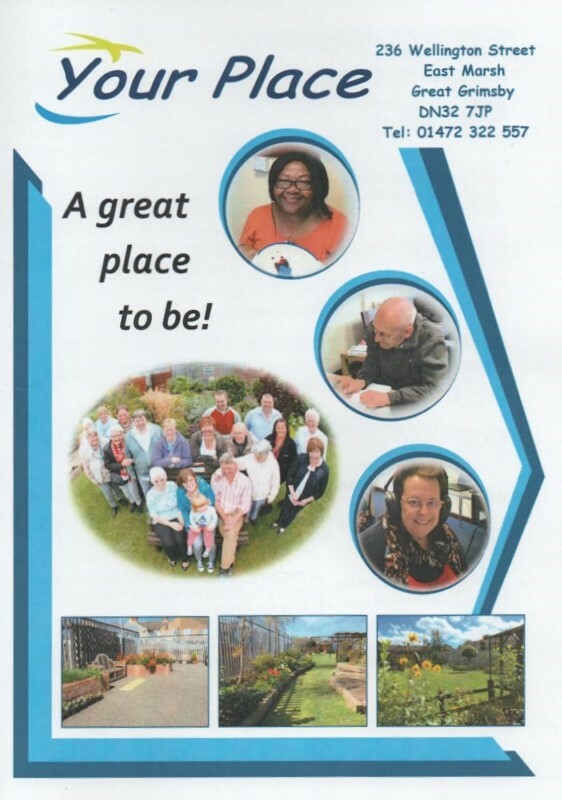 Known locally to all as the Shal Church it is based in the East Marsh area of Grimsby and serves a local community that is both resilient and proud but nevertheless is one of the most deprived areas in the country. Shalom Youth Centre is now the only youth centre still open in North East Lincs and John has been instrumental in the campaign to raise £40,000 to keep the centre open. The centre aims to reach children and young people at risk in the East Marsh through sustained long-term relationships to enable them to become functioning adults. John believes the young people need a safe haven because the streets are no longer safe and there are problems out there with drugs. The youth project is therefore important and provides a safe place for socialising and allows contact with youth workers. A positive impact can often be seen upon them and many return in later life to say thank you. John and others at Shalom are also involved in other work centred on the adjoining community centre and church. The Church holds regular church services and a Sunday Night “God Squad” meeting with Bible Teaching, a short communion, buffet meal and activities for children and teenagers. The Community side provides free Hot Meals Mon, Tues, Thurs and a breakfast on Fridays but just as importantly is open as a meeting place where people with all sorts of everyday issues can talk in confidence and receive help and advice and a point in the right direction. The Community Centre is a warm friendly place where parents and children are all welcome and help is always freely given. John is clearly dedicated to his community work and definitely deserves this recognition. Many thanks for all of your donations of items for our annual Sale Day on Saturday October 6th. 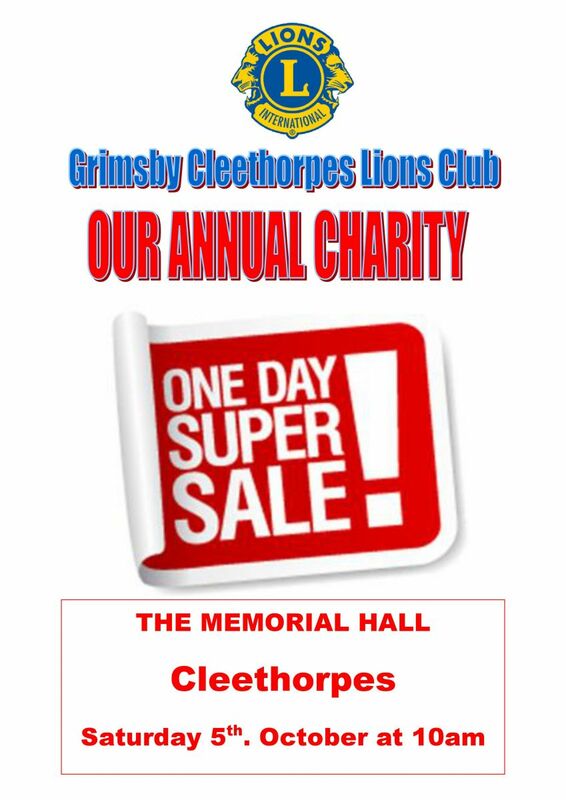 at the Memorial Hall, Cleethorpes.... it was a great day, and we made over £2,000 for our Charity Account. 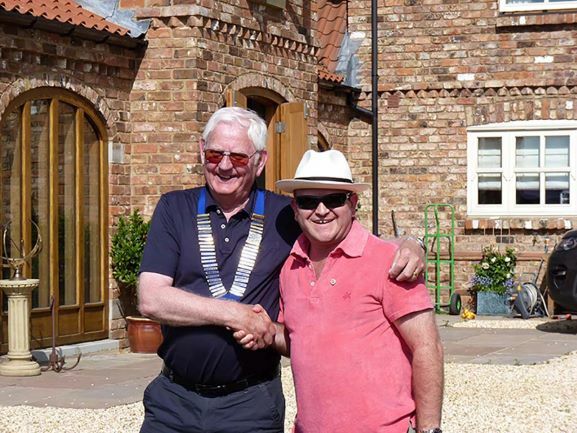 IN JULY .... we celebrated the hand-over from last year's President Mark Robinson to the man who will hold the reins for 2018/19, Mike Ramsden. The event was celebrated at Mark's home, and was enjoyed by all in beautiful sunshine. The food supplied by the Lions Ladies was as usual fantastic, and the atmosphere was great. Many thanks to Mark for a very successful year, and to both Mark and Jo for their hospitality. Mike has been President of the club on three previous occasions so is well used to the job, and in this the 50th. year since the club's formation recognises that celebrating our past achievements is not enough, and that we need to recruit new members for the future development of the club .... so if you're interested in joining us, just give us a call !!!!! !